Blackstone Elementary School parents and the school community threw a party to celebrate the prospect of walls and doors at their school. The Blackstone community members had marched from their school to the meeting to protest the loss of several key staff members in the 2019-20 budget, which was approved that night. The cuts were not restored, but community members were still happy to hear they may be getting real walls to replace the thin, noisy partitions they have now. The Blackstone was built in the 1970s as an “open plan” building. But experience has shown that the absence of walls leads to frequent distractions that get in the way of learning. At the School Committee meeting, fifth grade student Madeline Abel spoke about a different problem. If an intruder were to come into the building, she said, “We can’t hide. …We are sitting ducks.” She said intruder drills terrify the students because they know they couldn’t get away if there were a real threat. On Thursday, March 28, the B-PEACE for Jorge Campaign received the prestigious Peace MVP Award from the Massachusetts Coalition to Prevent Gun Violence. With the Peace MVP Award, the Mass Coalition recognizes significant and meaningful work by individuals and organizations to stop the scourge of gun violence in Massachusetts. The B-PEACE for Campaign is a project of the Episcopal Diocese of Massachusetts and, while based in the South End, B-PEACE has a state-wide reach. Several other gun violence prevention organizations led by young people, including March for Our Lives-Boston, also received awards. Massachusetts House Speaker Robert DeLeo presented the award to B-PEACE leaders at Temple Beth Elohim in Wellesley during the Mass Coalition’s Annual Event. The Peace MVP Award recognizes B-PEACE’s work over the last year, along with fellow award recipient the Pioneer Valley Project in Springfield, to bring attention to the need for gun manufacturers to play an active role in ending gun violence. The global headquarters of Smith and Wesson is based in Springfield and weapons manufactured by Smith and Wesson were used in the mass shooting at Marjory Stoneman Douglas High School in Parkland, Florida, along with other significant mass shootings in recent years. Smith and Wesson guns are also the most frequently used weapon in crimes in Chicago, one of the few cities that tracks and makes public such information about gun manufacturers. More than 25 other B-PEACE leaders were part of the 400-person crowd, who applauded and gave the teens a standing ovation. Among those gathered was Mirna Ramos, mother of Jorge Fuentes, a young man who grew up in the community of St. Stephen’s Episcopal Church. He was shot and killed at the age of 19 in front of his home in September 2012. 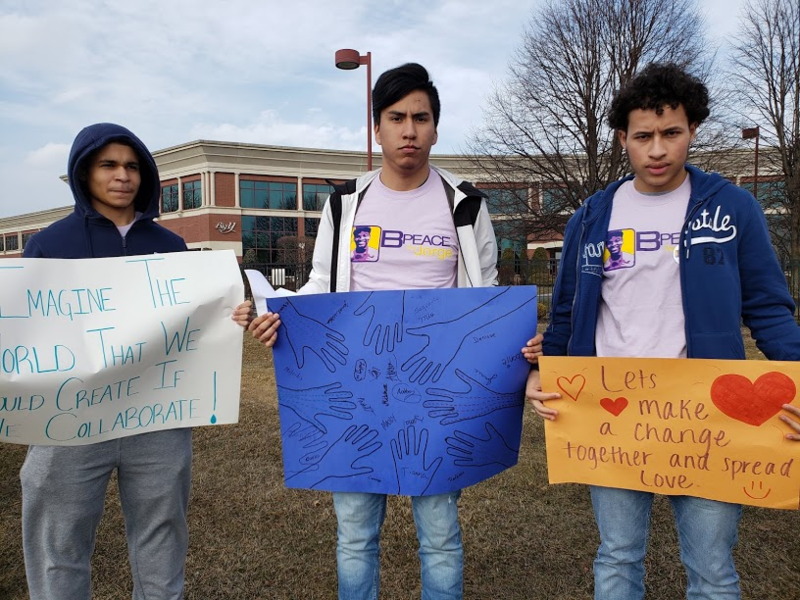 The B-PEACE for Jorge Campaign was started in the wake of the grief of this tragedy and strives to honor his memory by addressing the root causes of violence. Following the event, teens presented the actual award to Ms Ramos who wept and hugged the young leaders. After the event, while taking selfies with Hogg and each other, B-PEACE and Pioneer Valley Project leaders expressed gratitude for the award recognition and a re-commitment to the campaign to engage Smith and Wesson CEO James Debney in productive conversations for solutions to gun violence. To find out more about the B-PEACE for Jorge Campaign’s work or to get involved in their next action, please contact bpeace@ssypboston.org. As part of our commitment to equity in education, St. Stephen's Youth Programs (SSYP) invests in programs that help teenagers imagine their future after high school. And so, on Sunday, February 17, eleven teens and four staff people from SSYP set out on their second annual College & Career February Adventure. This trip, which takes place during the winter break from Boston Public Schools, offers teens experiences to think creatively and expansively about their careers and higher education. Over six days, teens visited six college campuses, met with professionals from multiple fields, built relationships with each other, and engaged in enrichment activities from Boston to Washington, D.C.
One goal of SSYP is to ensure that every young person graduates high school. For SSYP seniors the graduation rate is 100%, compared to a graduation rate of 72% in Boston Public Schools. A second goal is for each senior to graduate with a clear and specific post-high school plan. These plans are personalized and look different for every senior. Some plan to attend two-year community colleges, some a four-year public university, some go to private colleges, and some go on to vocational or job-readiness programs. Mentors and staff from SSYP work with seniors to ensure that plans match the academic interests, financial options, and social and emotional needs for each young person. Trips such as this one during February break help teens learn about and experience the various opportunities pathways that exist following high school graduation. The group started in Western Massachusetts with a visits to Fitchburg State and University of Massachusetts in Amherst. The tours at both campuses were led by SSYP alumni! Lisa and Steve Jenks, two South End residents, graciously hosted the group at their Williamstown house for two nights. The Jenks also brought the group to their own alma mater, Williams College. The stories shared helped spark the imagination of teens as they planned their own next steps. The group next traveled to Washington D.C., stopping along the way for chocolate at the Hershey Factory in Pennsylvania. A visit to the Smithsonian Museum of African-American History encouraged teens to think about their past while a networking night at the Obama Foundation helped them think about their future. Teens toured Howard University and Georgetown University, out-of-state colleges that many teens previously never thought of as an option. Staff at the Central American Resource Center offered another perspective and a night at the Big Apple Circus was pure fun. 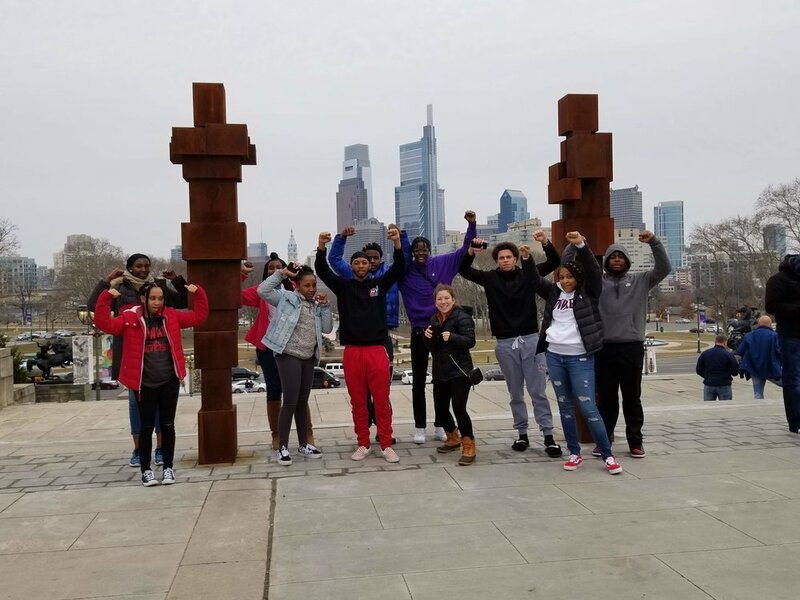 In Philadelphia, Pennsylvania, SSYP teens visited Temple University, ate cheese steaks (of course), and ran up the steps at the Philadelphia Museum of Art while channeling Rocky Balboa. As one teen summed up the trip, "It was six days and thousands of miles. I now have a better vision for my future and am excited about my next steps." SSYP strives to provide every young person with opportunities such as these. Whether it is the fall senior retreat, the College Access and Career Success trip, or the April Service-Learning trip to North Carolina, SSYP helps participants on their paths towards long-term success. If you want to hear more about this program, or want to get involved, please contact Senior Manager of College Access & Success, Jeremy Kazanjian-Amory at Jeremy@ssypboston.org. On Friday, March 15, youth organizers from the B-PEACE for Jorge Campaign came together with nearly 100 young people and adults from across Massachusetts to call for solutions to the issue of gun violence. This is at least the fifth time since March 2018 that youth and adults have gathered in Springfield at the global headquarters of gun manufacturer Smith and Wesson. 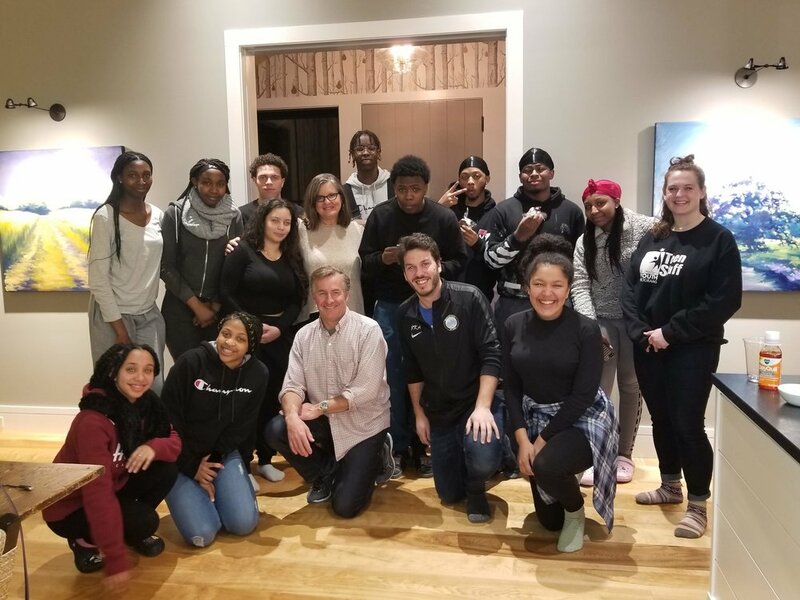 With hand-written signs, speeches, and a hand-delivered letter, youth leaders from the Pioneer Valley Project and the B-PEACE for Jorge Campaign renewed their invitation to Smith and Wesson’s CEO P. James Debney to meet with students. 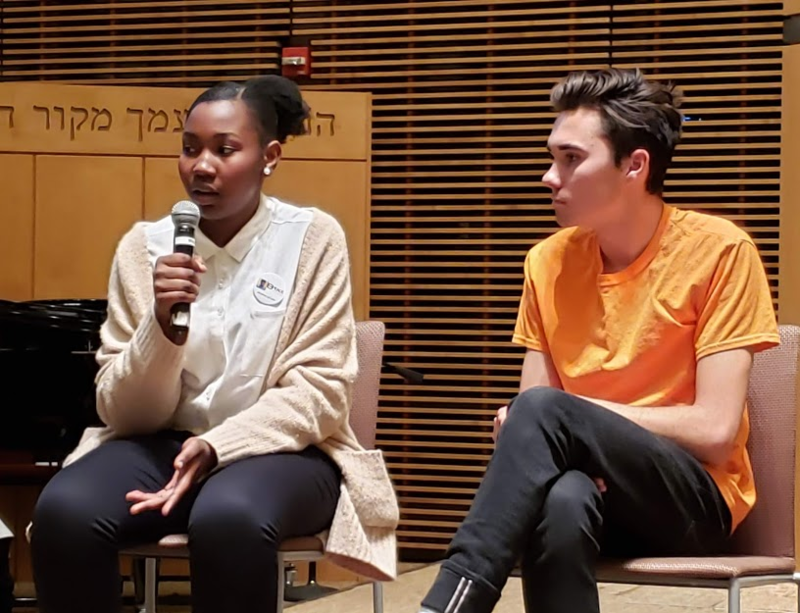 Across the country, youth and adults have been inspired by the leadership of students from the Marjory Stoneman Douglas High School in Parkland, Florida. These Florida students became activists and spokespeople on the issue of gun violence after experiencing a mass shooting at their school on February 14, 2018. Most of the national movement has focused on changing state legislation about guns, with student walkouts marching to state capitols. Here in Massachusetts, which has some of the strongest and most effective state gun laws in the country, students have been walking to and rallying at the gates of Smith and Wesson, one of the largest gun manufacturers in the United States. The B-PEACE for Jorge Campaign is based out of the Church of St. Augustine and St. Martin on Lenox Street and is a program of the Episcopal Diocese of Massachusetts designed to address the underlying root causes of violence. Teens from the South End and other neighborhoods of Boston, who are leaders in the B-PEACE for Jorge Campaign, are asking Smith and Wesson’s CEO Debney to be a corporate leader in developing solutions for the epidemic of gun violence in city neighborhoods and schools across the country. Youth believe that creative steps would emerge from conversation and might include such measures as a moratorium on sales of semi-automatic weapons, such as the AR-15 assault rifle. A rifle of this sort, manufactured by Smith and Wesson, was the gun used in the Marjory Stoneman Douglas High School massacre. As B-PEACE teen leader Nikkia Jean-Charles said, “This is not how the world has to be or should be. We and so many others are coming together to re-imagine what might be possible between the people who make the guns and the people who suffer from the guns. We think we can find a better way forward.” Other teen leaders agreed. “We’re not here to shut down Smith and Wesson. We’re here because gun violence is a real crisis in this country. We’re here because we want to sit down with CEO Debney and talk about how we can work together to end gun violence. We have some good ideas and we think he does too,” said Maana Daud, a 12-grader in Springfield and a leader with Pioneer Valley Project’s Youth Voices United. Still, teens believe that Smith and Wesson has a responsibility to be a corporate leader in finding solutions to gun violence. In addition to the Parkland shooting, Smith and Wesson is the brand of guns used in the mass shooting in a warehouse in Aurora, Illinois and the fully loaded pistol brought by a four-year-old to his preschool in Mount Gilead, North Carolina, among other examples. It is also the brand of weapon used most often in gun violence in Chicago, which tracks the manufacturers of weapons used in crimes. On Friday, security guards from Smith and Wesson refused to accept the invitation letter from youth leaders, saying they would call the police unless teens immediately got off the property of the gun manufacturer. Teens were undeterred and promised to be back. To find out more about the B-PEACE for Jorge Campaign, contact them at bpeace@ssypboston.org or follow them on Twitter @bpeaceforjorge. SSYP partners with the Blackstone School in many ways, including coordinating the school library. This would not be possible without the network of partners who contribute time, energy, funds, and books to the student readers. In January, Rowan Pantalena, Minister for Christian Formation at Grace Episcopal Church in Newton, led an Advent book drive for the Blackstone Library. On a mid-January Tuesday, on behalf of Grace and their rector, The Rev. Regina Walton, Rowan delivered a huge crate of books collected for the Blackstone Library along with more than $100 in Barnes and Noble gift cards. Big thanks to Rowan, Regina, and the congregants of Grace Episcopal Church. Check out the excited readers! 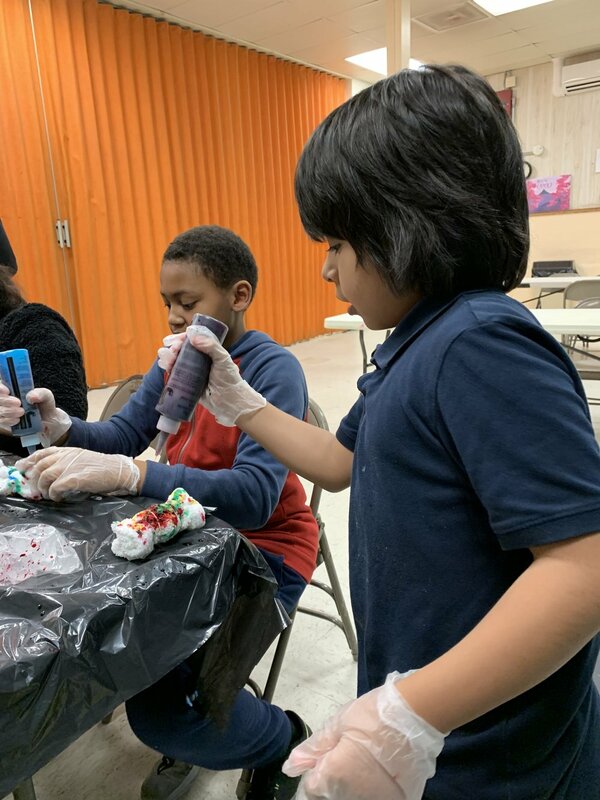 On Monday, January 21, more than 130 people from over 20 community organizations ignored the arctic temperatures, donned winter boots, and made their way over to the Blackstone School for the annual MLK Day of Action. 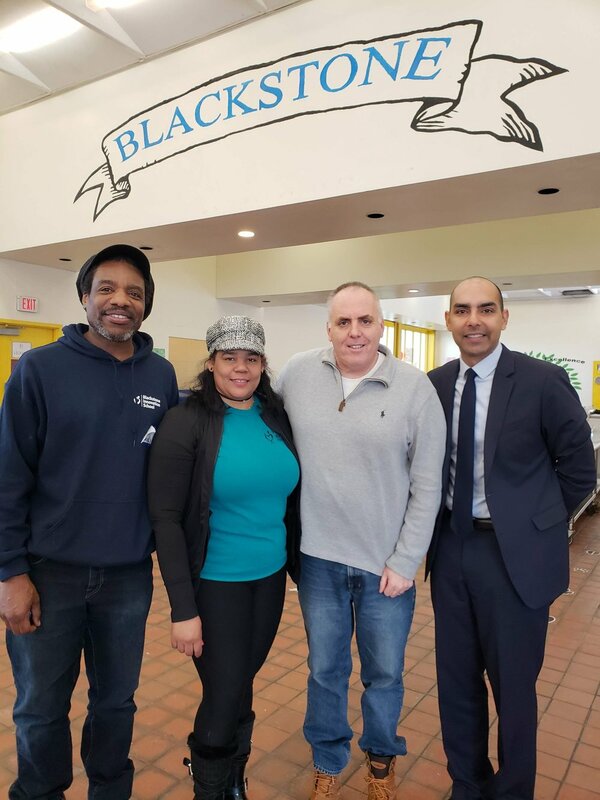 This is the ninth year that St. Stephen’s Youth Programs (SSYP) has organized the day of support for the school, along with key partners City Year, Friends of the Blackstone, Jewish Community Relations Council (JCRC), several Episcopal churches, and the B-PEACE for Jorge Campaign. The MLK Day of Action strives to advance the vision of the Rev. Dr. Martin Luther King, Jr. by combining work projects that improve the learning environment of the school with leadership workshops about issues of justice. This year, volunteers created scores of posters and window murals to inspire students, cleared out space for more effective occupational and physical therapy sessions, improved shelving and storage in the school library, assembled care packages for students to be distributed before April’s MCAS tests, organized the parent center and compassion closet for families, and added beauty and affirmations to the teacher lounge. Additional projects took place in SSYP’s afterschool space at 419 Shawmut Avenue, including a re-organization of the library there. As the training outlined, due to changes in status and formulas, the Blackstone School is facing a budget gap for the school year 2019-2020 and is eliminate $500,000 of staff and services from its already thin budget. This will likely result in the elimination of at least ten staff positions, including the family coordinator, school counselor, inclusion strand coordinators, classroom teachers, and other key roles that help to meet the educational requirements of Blackstone’s most high-need students. Blackstone teachers and parents, community partners, and MLK Day volunteers refuse to accept choosing between meeting the needs of English Language Learners and Special Education students. Instead, leaders are working together to solve this educational emergency by pushing for the necessary, full-funding for the school. 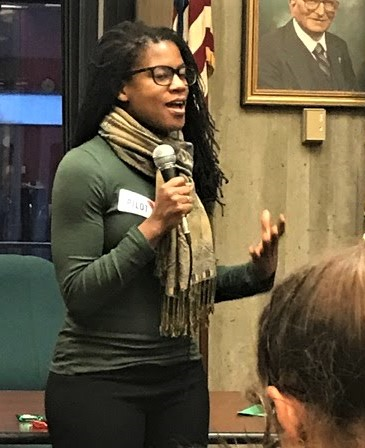 Participants in the leadership workshop made over 100 on-the-spot calls to Boston decision-makers in City Hall and the Boston Public Schools. Many of these leaders will be turning out again, this time wearing their dark-blue Blackstone “Ubuntu” t-shirts for the Wednesday, January 30 School Committee meeting at 6:00pm at the Bolling Building. State Rep. Santiago and City Councillor Flynn pledged their support for this effort and will be at the School Committee Meeting, too. Leaders from SSYP and the Blackstone School invite community members to support the Blackstone as their neighborhood school. To find out more about Blackstone’s budget crisis, support teachers and families, or to volunteer in Blackstone classrooms and library, contact Liz Steinhauser at liz@ssypboston.org. Volunteers from Congregation Dorshei Tzedek bring beauty to the Blackstone School. Inspirational words were posted around the school. Words to live by at the Blackstone School! With petitions, songs, costumes, and a brass band, students and other demonstrators from the PILOT Action Group staged a performance today in Boston City Hall, dramatizing their campaign to get wealthy nonprofits to contribute their fair share for city services. “Every day I read from textbooks older than I am, and I pray that there’s soap in the bathrooms, even though there never is,” said Fiona McManus, an 11th grader in Boston Public Schools, underscoring the need for fully-funded schools. City Councilors Annissa Essaibi-George, Lydia Edwards, Ed Flynn, and Michelle Wu addressed the crowd. "Boston is home to fantastic educational institutions, world-renowned hospitals, and distinguished cultural centers that help make our city great and attractive. However, these institutions own a lot of property in Boston, property that has not been reassessed since 2007," said Councilor Annissa Essaibi-George. "It is important that these nonprofit institutions pay their fair share of taxes to offset the burden on Boston taxpayers." Nonprofit organizations are exempt by state law from paying property taxes, even though they receive city services paid for by the taxes of others. In 2010, a city taskforce that included nonprofit representatives was convened by then Mayor Menino to come up with a way for nonprofits to shoulder a share of Boston’s municipal expenses. The taskforce agreed that wealthy nonprofits—those owning over $15 million of Boston real estate—should pay one quarter of what they would owe if they were not exempt. Half of that quarter can be in kind services to the city and its residents, or community benefits. These payments are called Payments In Lieu Of Taxes or PILOT. Payments began in 2012. Many large institutions have complied with the program but some of the wealthiest, especially some of the universities—Boston College, Harvard University, and Northeastern University—are falling farther and farther behind in their payments. Boston University increased its contribution from last year. In 2018, only 64 percent of the requested PILOT cash payments were collected, down from 90 percent in 2012. Altogether, wealthy nonprofits are more than $77 million in arrears since 2012. Most of that—$46.7 million—is due from the “Big 4” universities. The PILOT Action Group is a growing coalition of more than 20 community, faith, student and labor groups working to increase compliance with the city’s PILOT program by appealing directly to the wealthiest non-compliers and by asking the city government to hold nonprofits accountable for their missing payments. The organizations have issued a comprehensive report on the PILOT program and its shortcomings, packed a City Council hearing in August, and recently wrote letters to Mayor Marty Walsh and major university presidents seeking to meet with them about PILOT underpayments. The demonstration ended in the lobby of the Mayor’s office, where students and parents in full costume dramatized the Grinch story. 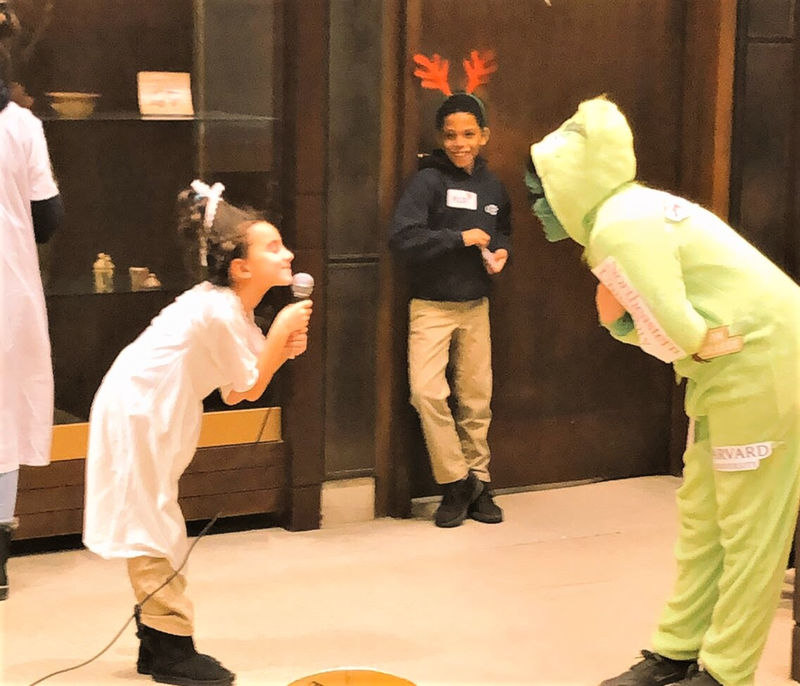 Seven-year-old Amy Polanco, dressed as Cindy Lou, insisted, “All I want for Christmas is for you to pay your PILOT Payments!” In the end, the green-faced Grinch covered in university logos handed “Mayor Santa Claus Walsh” a check for the $77 million dollar arrears, and the band burst into song. For more on the PILOT Action Group, visit https://pilotaction.weebly.com. City Councilor Lydia Edwards addresses the audience. Delivering a check for the $77 million in unpaid PILOTs from “Grinchy Universities” to the City of Boston. As we work to support youth in becoming healthy, successful individuals and strong leaders, we must remember the importance and value of service. In the JCIT (Junior Counselor In Training) program, there is a constant focus on personal development and leadership development among the 9th graders who make up our team. Lately, the JCITs have been hard at work planning and implementing a service project to give back to local children this holiday season. In late November, we had great brainstorming session where the JCITs pitched a variety of fundraising ideas. Eventually, the group voted on making deep-fried oreos and brownies to sell, and use the money to buy gifts for local children whose families need support this holiday season. The next week we made lists of exactly what materials we would need and calculated the cost. The JCITs were very focused on both cost and quality, noting bargains on certain items, but insisting we get Ghirardelli brownie mix because it is the best! We also decided to sell dog treats since we would be setting up shop at the park across the street, where many people take their dogs. After materials were purchased, we devoted a whole day of programming to baking, frying, and crafting. The finished product was beautiful: bags of sugar-dusted fried oreos, fudgy brownies, and homemade dog biscuits, all tied with ribbons and a festive gift tag containing a picture of the JCIT crew and the list of ingredients we used. The day after making our products, we sold them at the park, talking to lots of community members, and petting lots of dogs. After standing hours in the cold, and pushing ourselves out of our comfort zones, we raised a total of $295!!! Last Thursday, we took our money over to Target and picked out gifts for the kids whose wishlists we had been given. The JCITs really took ownership of this project, and let their leadership skills shine. We all got to grow our skills in business, fundraising, baking, crafting, communication, advertising, customer service, and shopping on a budget! I was impressed with the devotion many of them showed to the project, and know that there are more service projects in our future! 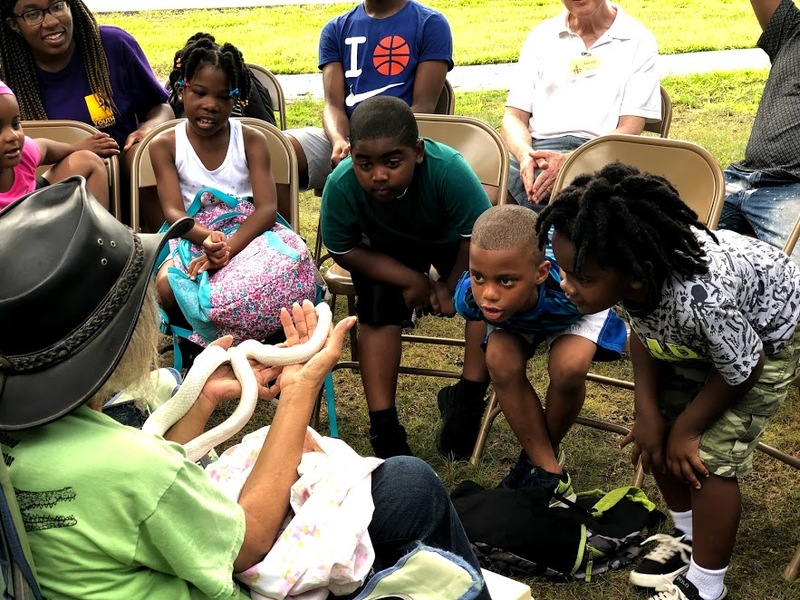 St. Stephen’s Youth Programs (SSYP) and the Blackstone Elementary School kicked off their ninth year of a formal partnership and readers of all ages celebrated their love of books. One of the signature projects of SSYP is the school library, which was without one for almost a decade before the partnership. The Blackstone Library is open to students and teachers five days a week. With close to 12,000 well-organized volumes on the shelves, an online database of these books, regular author visits, a subscription to the search engine EBSCO, and a cheery, well-lit space, the Blackstone is one of the premier elementary school libraries in Boston Public Schools. This is all thanks to a team of dedicated volunteers and resources raised outside of the school’s regular budget. 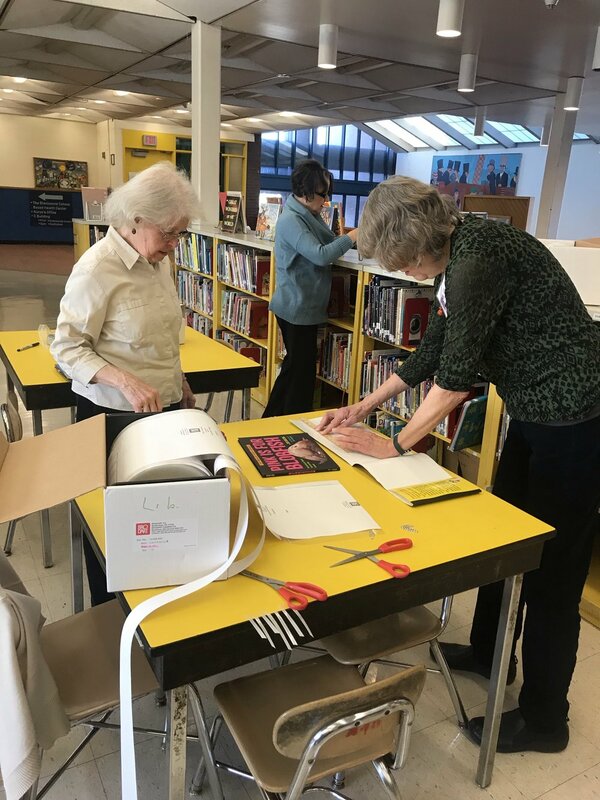 Library volunteers, who are neighborhood residents and members of suburban Episcopal churches, welcome two-thirds of the school’s classrooms (23 of 35) for weekly visits to the library for read-alouds and book-borrowing. Adults work hard to get to know each young person in grades K0 to 5, helping students find the “just-right” book to read independently. In October, young readers at the school met Newbery Honor-winning author Adam Gidwitz. This and other author visits to the Blackstone School have been made possible because of SSYP’s partnership with Wondermore, Inc., a Boston-based non-profit agency that seeks to “cultivate children’s curiosity, creativity, and academic achievement by igniting a love of good books.” During his time at the school, Gidwitz presented his new series, The Unicorn Rescue Society, and shared insights into the writing process with an enthusiastic audience of third graders. Thanks to the generosity of Wondermore and Gidwitz, each student took home a copy of the first book in the series. Wondermore also provided copies of the next two books in the series to all the third-grade classrooms and to the Blackstone Library, where they are proving to be popular checkout choices! In November Blackstone Library volunteers led activities at the Blackstone’s Family Literacy Night, an annual event that encourages a spirit of literacy at school and at home. More than forty students visited library, bringing their friends and family members, to make bookmarks, pick up some reading-related swag, and read stories to the library’s mascot, Clifford the Big Red Dog. The library program relies on volunteers who keep their focus on supporting classroom teachers and enriching the reading experience for students. If you are interested in learning more about volunteer opportunities in the library, please email the Blackstone-SSYP’s Library Coordinator, Tricia Harvey (tricia@ssypboston.org) to arrange a visit or join the next orientation session. Be sure to mention in the Order Comments section that you are ordering for Blackstone Library to receive a 10% discount. Choose "In-store Pick-up" as the delivery option and Blackstone Volunteers will take it from there. If you are familiar with our program, you may know that the well-being of all of our youth is always our main priority. Every day, apart from helping 130 kids with homework and other enrichment activities, we also provide our youth with a meal. The meals we provide our kids are warm when appropriate and hearty which allows for our youth to make it through the afternoon with full bellies. For some years now we have tried our best to include our families in this part of our afternoon by asking that they help us provide snack. This year we put a little more effort into reaching out to our families for help and we have had such a great turn out so far! Every Thursday we have been so lucky as to have 2 to 3 families help us provide snacks for our kids! It has turned into a day the kids look forward to as they eat the food that their families prepare and we thank the kids whose parents cooked for us. The YLC middle school program had its first race on October 20th, “THE JP FUN RUN,” and the youth did a great job completing the 5K. The youth enjoyed all the support during the race: they got to see some of their middle school teachers who are involved in Sole Train, Megan, who was their Site Coordinator for St. Stephen’s last year, and even some outside friends. One youth name Fanleys and his running old sole Kyshawn completed the race in 33 mins. Another youth Dana and her old sole Maggie completed in 43 mins. The race was provided by a community-building and mentoring program that uses running as a vehicle for setting and achieving seemingly impossible goals. As a supportive community of caring adults and peers, Sole Train champions young people as they realize their capacity for greatness. Come cheer us on at our next big race in May of 2019 “ The Run to Remember”. Or every Tuesday and Thursday as we run in the South End for practice. Anyone who knows me well knows that math and I have never gotten along. I was able to keep up enough to pass but I never felt like I got it. Fractions were particularly difficult for me so I can empathize with our students who struggle to grasp certain concepts or subjects in school. It is easy to fall behind and harder and harder to catch up. While my parents and teachers did the groundwork to help me understand the general concept of fractions, it didn’t fully click until I looked at it in a different context...music. I could read and understand music--that made sense to me. It was when I stopped thinking about the fractions as math I realized that I did understand them and had, in fact, been using fractions this whole time when subdividing musical measures and melodies. The skills were there but something about the formal classroom setting caused a disconnect. The only way for me to reconnect with these skills was to practice them in an area I felt skilled at and that I found enjoyable. This is the basis of my theory on learning through play. Standard classroom learning can be an intimidating and sometimes cold environment. The last thing I want when facilitating a lesson is to have youth stressed or disengaged. I’ve noticed that our youth tend to loosen up when you take out the classroom feel and incorporate more abstract activities, competitions, and games. This theory also is the reason that we introduced Skillz Lab this year. Skillz Lab offers a variety of activities for youth to engage in but the catch is that each activity is stimulating some area of their brain. 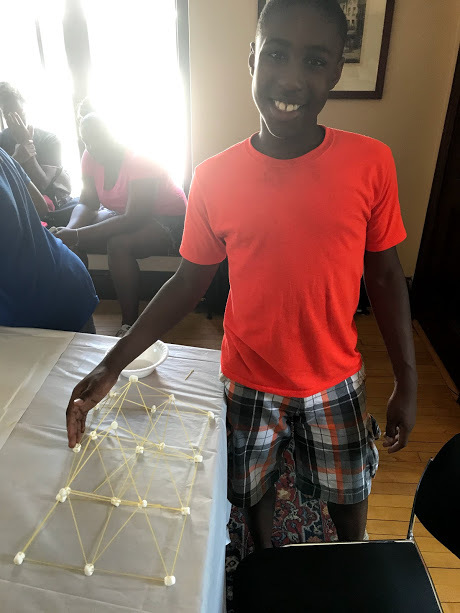 For example, when you challenge a child to build the tallest lego tower, their mind is learning about engineering and architecture. In a Play-Doh version of a “Cake Boss” bake-off, a child’s sculpture is really just practicing concepts in fine art, color theory, and geometry. A simple activity surrounding planting seeds has youth inadvertently learning about living organisms and the science of botany. “Fill in the Caption” comic books are really just storytelling, dialogue, and writing in disguise. Skillz Lab in particular is embodying our B-READY 2018-19 theme “Change Can’t Wait” by trying something radical with the hopes of a positive outcome. Within an afterschool setting, we are fighting an uphill battle by offering classroom structure after a child has already had a 6+ hour school day. In my opinion, it does us no good to pretend to be what we are not--in this case, teachers. This is especially true when you consider that learning is constant and limitless and that humans learn a variety of ways. The formal classroom setting has already been provided by each of their schools. What we can provide is the supplemental practice and real-life application of those learnings. What we can provide is play. 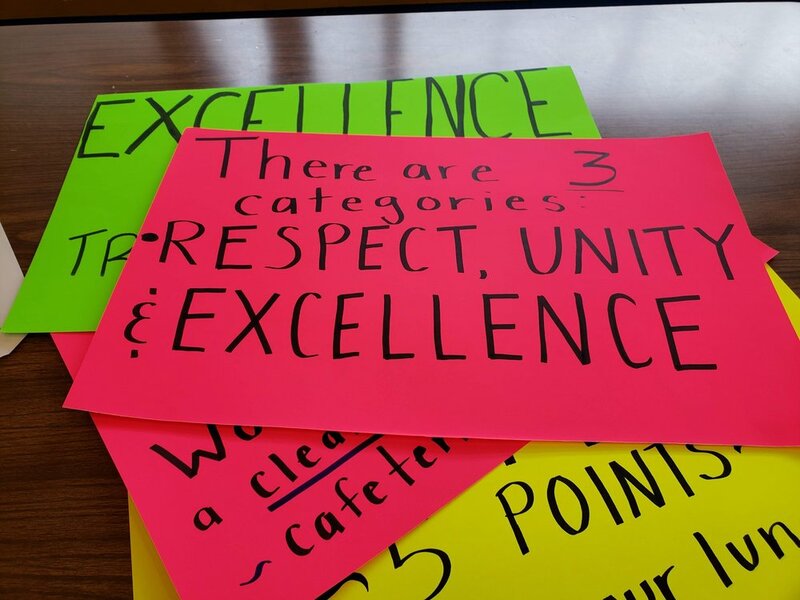 By Vicky Ajene, Manager of Academic and Enrichment Programs. From the Open House to Tacos & Trivia and the first Mentor Training, adult and teen participants alike have shown passion and interest in cultivating their mentoring relationships. The official mentor kick off was on October 4th at the Volunteer Open House. The room was buzzing with conversation and excitement about the upcoming year. With thirty volunteers roaming around the building, a mix of new and returning, I felt my own passion and excitement growing with each person I talked to. On that Thursday evening, I left work feeling more ready than ever to cultivate mentor matches and plan events. The first event I planned for mentor and mentee matches was Tacos & Trivia. Here, the interest in mentoring for youth and mentors was obvious over five competitive rounds of trivia. At the end of the fifth round we had a three way tie. After some careful deliberation, the judges decided that whoever could list the most Disney movies in one minute would take home the trophy. After an intense sixty seconds, the underdog of the game won the Fall 2018 Taco's & Trivia! Join us on November 16th for our next Mentor/Mentee Night! On October 16th we had our Mentor Training kickoff event! We were happy to welcome Janeen Smith of Mass Mentoring Partnership to facilitate this training. All our mentors found something new to learn and reported that this was a helpful training. Our next training on November 5th will have a focus on mentor check-ins and how to build your mentor relationship. I can't wait to see what this incredible year of mentoring relationships will bring for our teens and their mentors. Welcoming a New Site Manager! Hi, my name is Cassandra Bernabel and I am the new site manager for the St. Augustine and St. Martin location. This is a new role for me, but I have actually been a part of the program for approximately 10 years. I started working for St. Stephen’s as a counselor in training when I was 15 years old. I grew from that position, taking on more responsibility as a site assistant and, later on, as a lead counselor. After a two-year break, gaining different skills and knowledge concerning youth with autism and animal welfare, I have returned to an environment that has always brought me joy. To be exact, I have returned to St. Stephen’s to continue to pursue my passion with children and to gain more experience for a possible future career in teaching. The narrative at Trinity Concord with St. Stephen’s Boston couldn’t have been further from that kind of panic when we launched B- Cool in early August. When we heard that St. Stephen’s kids were coming to play at our house, parishioners from every generation stepped up for the sheer joy of it. Collaborations in baking, photography, floral design, collecting, writing, organizing, recruiting, gardening, teaching, smiling and laughing made the day. From our youngest camper (age 5) to our oldest volunteer (91) we worked together, got hands dirty together, shared stories together and got sticky, soaked and sudsy together. Trinity’s teenaged “sidekicks” supported individual teams to guide and get to know their campers as they moved from activity to activity. In 4 hours, some 60 campers, 15 staff and CITs and 25 volunteers shared hundreds of interactions – some planned, some serendipitous. These connections deepened the gratitude for our long-standing ministry with St Stephen’s. We wouldn’t have believed it if we hadn’t seen it with our own eyes, heard it with our own ears and felt it in our own hearts. Click here to see our one-day adventure for yourself. Welcome to our new Fellows! This week St. Stephen's Youth Programs welcomed three new staff members for 2018-2019! Thanks to our partnerships with the Mass Promise Fellowship and Mass Mentoring Partnership, we are thrilled to welcome Tasha, Jennie, and Emily. Read on to hear from them about why they're here! My name is Latasha Scott and I am a first year Massachusetts Promise Fellow. I wanted to commit to a year of service to develop real-world skills through a hands-on service. I want to create equity for the up coming youth by helping them break down barriers and build up the confidence by knowing they can achieve anything. Through my year of service I hope to make a impact on the participants with the wisdom I obtained and the compassion I provide. My name is Jennie Bruno and I'm a first-year AmeriCorps Massachusetts Promise Fellow working as the JCIT Coordinator and one of the teen staff supervisors. I wanted to do a year of service because I wanted to purposefully and proactively grow as a leader and learn more about youth work and community work. I want to make a difference for young people, giving them the support and resources they deserve instead of the inadequate environments and lack of opportunity society often leaves them with. My hope is that the world will become a better place, but I know that in order for that to happen we need to empower and encourage our next generation of leaders. My name is Emily DeMazza and I’m the Highland Street AmeriCorps Ambassador of Mentoring through the Mass Mentoring Partnership. I’ll be working with volunteers overall as well as the mentoring program to put on orientations, training and activities. I wanted to do a year of service to help connect youth with adults and foster relationships that will make a meaningful impact for both the mentors and the mentees. I can’t wait to meet all of you and work with our youth! As 100+ scholars poured into Epiphany, ready for B-SAFE, I remember being fearful that I could not contain all the energy, that the future lesson plans would end in disaster. This fear came from my lack of experience in such an environment, and yet, the scholars proved me wrong. With some support and attention, their final projects for STEM, a Rube Goldberg machine, turned out creative and unique. During the closing ceremony, I asked them what their favorite STEM activity was, and many said that it was working on the Rube Goldberg machine. Another student said that STEM had been her favorite academic rotation. I also saw two students using Jenga blocks to create a mini Rube Goldberg machine during their break time. I could not be prouder of them. These scholars have taught me how to be patient and adaptable; they have taught me more than I could have ever taught them. Emily is a rising sophomore at Princeton University, majoring in Molecular Biology. She helped design and implement the STEM curriculum for LEARN and for YLC at St. Luke’s Church. She aspires to be a physician scientist and is passionate about issues relating to minorities and education. She comes to St. Stephen's through Princeton Internships in Civic Service (PICS). It is very easy to fall into the trap of teaching to the test or thinking that in order for children to grow and learn they must be contained in an extremely structured, student sits and teacher teaches, direct instruction kind of environment. At the B-SAFE program at Epiphany LEARN that is not how learning happens. The same way kids come in all types of personalities and different backgrounds so does the way they learn. Not all participants learn the same way. It is important that as educators and youth workers we understand that. The world we live in is different, the environment in which our children grow in is different, and so the way they learn is also different. Learning can happen in all types of forms. Learning can be measured in all types of ways. Test should not dictate the content taught or the manner in which learning happens. This leaves with the question of, how do children learn? The first step is taking the time to get to know them, their families, and their individual needs. As you take the time to build that foundational relationship, you build trust, you learn about their strengths and areas that need more growth. When we engage families we get a more accurate picture of the child and come to understand their needs even better. This foundation is crucial in helping learning happen. You then tailor your lessons to those needs and little personalities. Learning can happen while out exploring in a field as much as it can happen sitting in a classroom listening to a lecture. Learning can be measured in a conversation as much as in the completion of a worksheet. If this is true, then we should be making learning more engaging to children by making it fun. The best learning happens when kids don’t necessarily realize that they are learning something new. This learning is permanent because it is t engrained with happy memories. This is the learning that comes from something being created and all of our senses activated. Effective learning is when we have kids at the edge of their seats with suspense eager to take in more information. It’s when they have smile on their face because they can see and understand the growth that they just underwent. This is how effective teaching should always be. This the direction that successful prevention of the summer slide should take. This is how we have fun learning at B-SAFE.